"For a long time they lived on Caddo lake, on the boundary between Louisiana and Texas, their principal village on the lake being Sha'chahdínnih, 'Timber Hill.'" Unknown Caddo storyteller to James Mooney, anthropologist at the Smithsonian Institution in the 1890s. 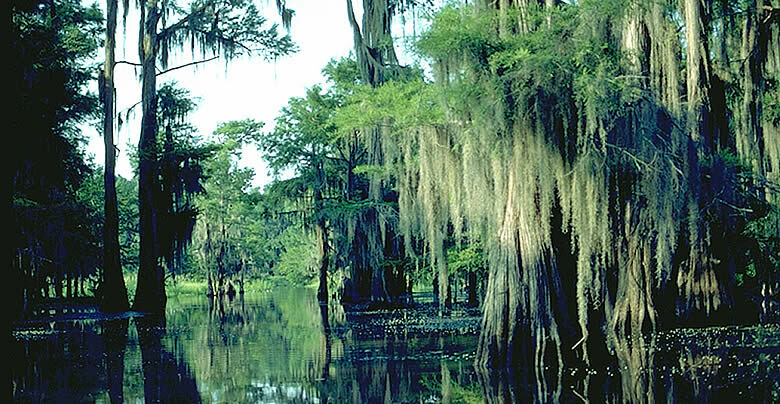 Photo of Caddo Lake today courtesy Texas Parks and Wildlife Department. Locations of Caddo villages in the Caddo Lake-Shreveport vicinity, 1795-1842, including the site of Sha'chahdínnih (Timber Hill). Graphic by Roland Pantermuehl, Texas Historical Commission. Crew member Derek Edmonds, who traces his ancestry through both Caddo and Wichita Indian lines, participated in the full week of excavations. He learned Caddo ways, songs, dances, and traditions beginning in early childhood and shared these with the crew. Photo courtesy Marion County Historical Society. Caddo villages on the Great Bend of the Red River prior to the settlement of Sha'chahdínnih, as shown on Nicholas King's map of the Freeman-Custis expedition of 1806. (Library of Congress). are brave, despise danger or death, and boast that they have never shed white men's blood. -John Sibley, Nachitoches physician and Indian agent, 1805. Caddo chief Show-e-tat, or "Little Boy." Born in 1816, possibly at Timber Hill, he was also known as George Washington. Photo circa 1868-1872, courtesy National Anthropological Archives, Smithsonian Institution (Negative No. 43944). The village on the lake became a place of crying. -Caddo historian Cecile Elkins Carter. Deep in the swampy woods of East Texas near the Louisiana border, Texas Historical Commission archeologists found some pieces of broken pottery and glass, a handful of beads, a couple of buttons, and other odds and ends. It wasn't much, but they knew they had finally solved an old mystery, the exact location of a certain Caddo Indian village occupied from 1800 to about 1840. The collection of artifacts, though meager, was doubly precious to some of the volunteers on the excavation crewdescendants of the 19th-century inhabitants of the settlement. Called Sha'chahdínnih (Timber Hill), it was the last village of the Kadohadacho Caddos in their native homeland, a place still of great emotional and spiritual importance to modern Caddos. It contains the last vestiges of more than a thousand years of Caddo occupation of Texas, which came to an end in 1859 when they were removed from a north central Texas reservation to Indian Territory, now Oklahoma. The village itself was not very old when it was abandonedCaddos had lived there for some 40 years. The original home of the Kadohadachos centered on the Great Bend of the Red River, but smallpox and Osage Indian attacks had forced them to move time after time down the Red River. By the time these moves began in 1788, the core group, called the Cadodacho or Grand Caddo, had consolidated with several formerly distinct Caddo villages in the vicinity to form the cultural unit known as the Kadohadacho, and as they moved downriver they absorbed another closely related population, the Petit Caddo. Once in their Timber Hill village, the Kadohadachos sympathetically allowed other Native American immigrants into their territory, most notably the Coushattas and Alabamas, who had been driven west by continuous white pressure. What forced the move to Timber Hill was nothing less than a natural disastera huge mass of timber and debris that dammed up the Red River, forcing water out of its banks and onto the surrounding land. This "Great Raft" created Caddo Lake. The Kadohadachos could see that their village, which was on a floodplain, would soon be inundated, so in 1800 they sought safer ground. The Kadohadacho were one of three major Caddo divisions. The other two were the Hasinai and the Natchitoches. 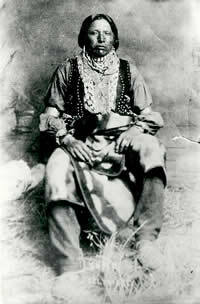 The Hasinai were the most numerous, but the Kadohadachos were said to be the most respected among other Caddos. By the time they had been at Timber Hill for five years, their numbers had been reduced to about 450 adults, but the Kadohadachos still exercised a great deal of authority over related tribes. John Sibley, a Natchitoches physician and Indian agent, wrote in 1805 that the Kadohadacho warriors were "looked upon somewhat like the Knights of Malta, or some distinguished military order. They are brave, despise danger or death, and boast that they have never shed white men's blood." Not only did they pride themselves on not killing European settlers, the Caddos had long acted as intermediaries between the Europeans and other tribes, as well as among the various tribes of the region. They were considered important political and economic allies by the governments of France, Spain, Mexico, and the United States. During the time he lived at Timber Hill, powerful Chief Dehahuit honored a request from the Indian agency in Natchitoches to serve as a traveling diplomatic ambassador to the tribes bordering Caddo territory. His task was to persuade them to remain peaceful and friendly toward both Americans and Spaniards while the two nations were coming to terms over the Louisiana Purchase. Indian agent Sibley described Dehahuit as "a remarkably shrewd and sensible fellow." Life at Timber Hill, aside from politicking, was probably a cycle of traditional religious practices, farmingthey raised corn, beans, and pumpkinsand hunting. Every year in November almost all the able-bodied men left for four months to hunt on the buffalo plains to the northwest. But by November of 1830, when Chief Dehahuit led his men on the annual hunt, leaving behind women, children, and old or disabled men, the village's situation was dire. People were starving. Drought and flood had ruined their crops year after year. 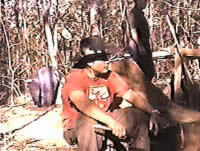 Other tribes driven into Caddo territory and Euro-American settlers had killed almost all the once-plentiful game. Indian hunters from Timber Hill had already been decimated by disease: The year they moved to the site, smallpox killed almost half of them; three years later, measles took more. "The village on the lake became a place of crying," wrote noted Caddo historian Cecile Carter. All the while, settlers were pushing westward, ever hungry for more land. 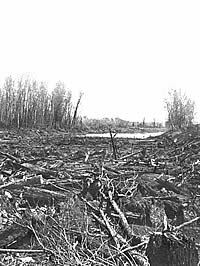 The huge logjam that had forced the Caddos to move from their floodplain village now protected Timber Hill from encroachment, as it prohibited boat passage on the middle Red River. But plans were underway to remove the Great Rafta battering-ram steamboat had been invented to break it up. Work began in 1833, the same year Chief Dehahuit died, and by April 1835 the Red was cleared, opening river traffic all the way to Shreveport. Now nothing could stop the white invasion of Caddo territory. 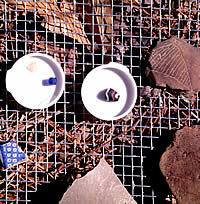 Artifacts, ranging from European-manufactured ceramics and beads to pottery made by late Caddo peoples, helped verify the location of the site of Sha'chahdínnih, Timber Hill. 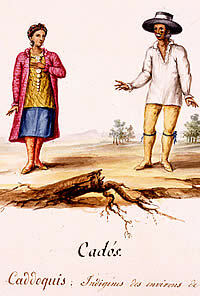 A Caddo couple in Nacogdoches, Texas, in 1828 drawn by Lino Sánchez y Tapia after José María Sánchez y Tapia. Courtesy Gilcrease Museum, Tulsa. This site represents the end of a culture in its homeland after thousands of years. The "Great Raft," a huge mass of timber that formed a logjam, dammed up the Red River and flooded the surrounding area. Photo by R. B. Taylor, courtesy Louisiana State University, Shreveport, Noel Memorial Library Archives. Deer on the edge of an East Texas forest. During the time of Timber Hill, once-abundant deer and other game were killed in large numbers by encroaching immigrants to the Caddo lands, making conditions even more perilous for the villagers. Photo courtesy Texas Parks and Wildlife Department. 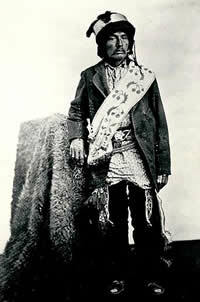 Enoch Hoag, last traditional chief of the Caddos (1896-1929). Date of photo unknown. Courtesy National Anthropological Archives, Smithsonian Institution. (Negative No. 1373b).